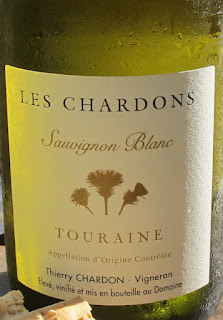 I have a few wines to tell you about presently, but today seems to be calling for this delicious Sauvignon Blanc from the Loire region of France. Light lemony yellow in color, It is pure sunshine! A briny, flinty minerality emerges on the nose. With light grapefruit on the palate and a lovely floral quality, along with a hint of pineapple (tropical fruit), it is clean, clean, clean and smooth, with a creamy mouth feel and dry finish. Lightly perfumed with citrus overtones and surprising depth, this is an awesome/extraordinary “every day” wine and an amazing value! I loved it. Ned (Devenish Wines) likens this to a Sancerre, without the snobby Sancere price tag. Yes! However you choose to characterize this, it’s a fabulous “Go To” summer wine. 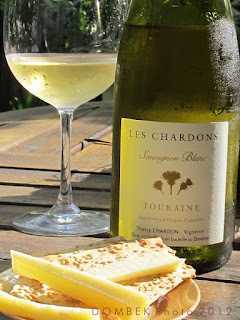 Have with simple plate of cheeses, crackers, bread and fruit as an aperitif, or perhaps with a seafood salad and crisp baby greens or summer grilled vegetables! Bring it on the boat! $12.99 at Rosemont Market. The vineyard is located in the town of Couffy on the southern slopes of Cher in the heart of Touraine in the Loire region of France (Sancerre to the east) and home to beautiful Loire Chateaux castles. These chateaux were built by seventeenth and eighteenth century aristocrats attracted by the agricultural wealth and abundance of the region. As to the terroir, it is composed of flint, clay and limestone, which truly shines through in this wine. Winemakers Thierry & Sophie Chardon founded the vineyard in 1996, with six years of rich experience on a farm in Mareuil sur Cher as vineyard manager and also the experience of his elders – winemakers for generations. Available at the following: Rosemont Markets, Browne Trading and Aurora Provisions in Portland; Freeport Cheese and Wine Shop and Provisions in South Freeport; Bandaloop Restaurant in Kennebunkport; Oak Hill Beverage, Scarborough; and the Blue Hill Wine Shop in Blue Hill.